with our high quality products. Are there quality problems with your existing suppliers ? Do you have capacity constraints in your production ? 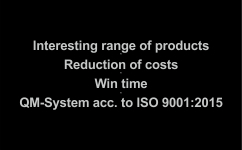 Would you like to reduce your costs ? Are you planning a project ?